The rapid rise and breakneck evolution of UAS has resulted in a huge diversity in shape and size. Claire Apthorp takes a look at the most interesting designs coming out of R&D labs around the world. When they first began to enter the military toolkit in significant numbers in the 1990s, it quickly became apparent that unmanned vehicles had the capability to revolutionise the modern battlefield. As they have increased in numbers across the globe, air, land and sea unmanned technology has reached new and interesting levels of development, with researchers increasingly thinking outside the box when it comes to how this technology will look and perform on the battlefield of the future. A key design principle of many unmanned aerial systems (UAS) is that in order to maximise their potential for airborne intelligence, surveillance and reconnaissance (ISR) that they must be covert. This has led many research and development (R&D) houses down the path of designing UAS to mimic birds and animals that are less likely to draw attention than UAS that look like aircraft. 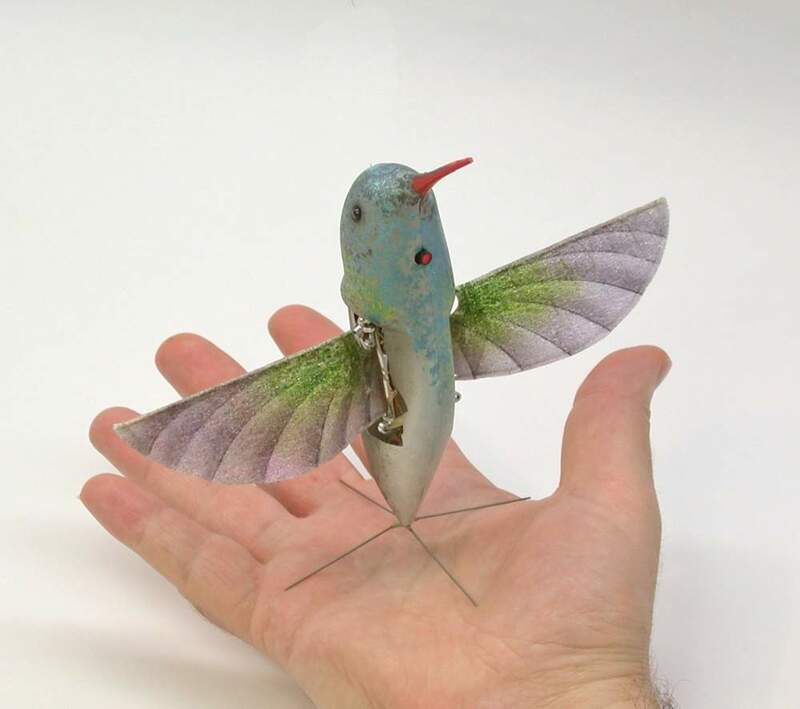 Among the first designs here was the AeroVironment Nano Hummingbird UAS developed as part of the Nano Air Vehicle programme led by the Defense Advanced Research Projects Agency (DARPA). This 19g hummingbird-like – in looks as well as manner – flying prototype was capable of controlled precision hovering and fast-forward flight using its two flapping wings for propulsion and control. Its movements mimicked that of a small bird, and it was able to climb and descend vertically, fly sideways left and right, forward and backward, as well as rotating clockwise and counter-clockwise, under remote control and carrying a video camera payload. The idea of applying design ingenuity derived from the natural world to the robotic has other benefits besides lowering detectability during operations. Often R&D is led by a particular animal because its method of movement or body shape has been honed over millions of years of evolution, and is – frankly – simply a good idea. Take the snake, for example. 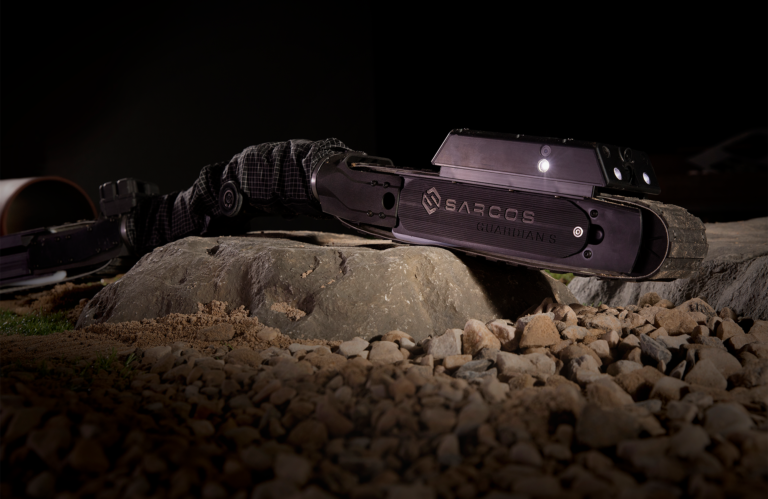 Sarcos has tapped the physicality of the snake for its Guardian S unmanned ground vehicle (UGV). This system mimics a snake’s efficient way of moving over terrain, enabling it to traverse challenging terrain including climbing stairs or passing through narrow culverts and pipes. It can also scale the inside and outside of storage tanks, pipes, maritime vessels, vehicles and other vertical surfaces and access confined spaces as low as five inches – all while being low profile. The 16lbs robot can carry a ten pound payload, facilitating real time video, voice and data communications while exploring high risk areas above and below ground, and observing dangerous environments to keep its operator out of harm’s way. A number of systems have been trialled under DARPA projects that aim to tap into the mobility, agility and load-carrying capabilities of larger animals, including dogs and cats. Boston Dynamics’ BigDog was a four-articulated-legged UGV designed to run at speeds up to 10kph, climb slopes up to 35 degrees and traverse difficult terrain including gravel and rubble, in snow and water, while carrying a payload of up to 150kg. 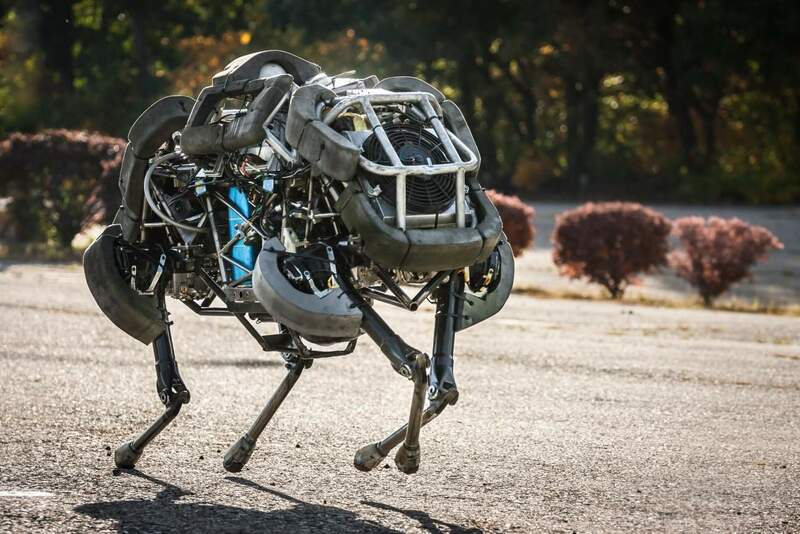 WildCat – ticketed as the “fastest free running quadruped robot in the world” – was funded under DARPA’s Maximum Mobility and Manipulation programme. This system is powered by a methanol burning engine that drives a hydraulic actuation system to move in a variety of gaits, including trotting, bounding, and galloping while running and manoeuvring over relatively flat terrain. Dynamic control algorithms and a variety of sensors contained within the on-board computer control and stabilize the running motion, and laser range finders accurately measure the robot’s height and attitude above the ground. Animal behaviour is also a hot topic when it comes to unmanned technology development. In January 2017 the US Department of Defense announced that it had carried out a demonstration of an in-development micro UAS operating as part of a swarm. The test saw 103 Perdix UAS – originally developed by MIT Lincoln Laboratory – launched from three F/A-18 Super Hornets which then demonstrated advanced swarm behaviours such as collective decision-making, adaptive formation flying, and self-healing. Perdix are 290g micro-drones capable of low-altitude ISR missions. They can fly for up to 20 minutes at a speed of 40-60 knots, powered by a 2.6in propeller. Rather than controlling all drones in a swarm individually, the operator calls “plays” – such as carrying out survey over a field – and Perdix decides how best to run them; because Perdix cannot change their plays, operators can predict the swarm’s behaviour without having to micromanage it. The vehicle is currently on its sixth generation, which includes an improved canister and injection‐moulded fuselage, and work is currently underway to find companies capable of rapidly building multiple units and to advance “Generation 7” autonomy. While in the air smaller systems are creating a buzz, under the sea the technology is heading in the other direction. 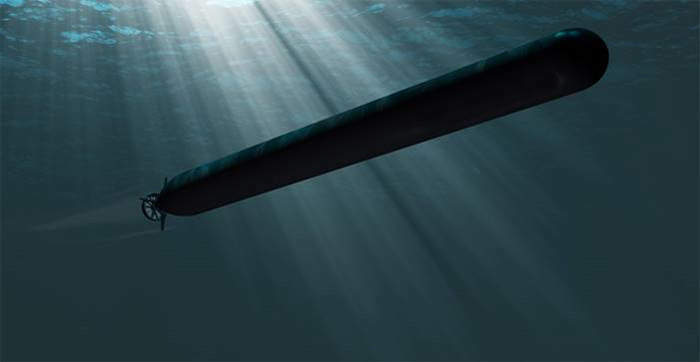 Lockheed Martin has been awarded a contract for the design phase of the US Navy’s Extra Large Unmanned Undersea Vehicle (XLUUV) Orca programme. Lockheed Martin’s long-range autonomous Orca unmanned undersea vehicle (UUV) solution will be capable of carrying out a number of missions, including ISR, mine-countermeasures, indication and warning notification, and anti-submarine warfare training. Thanks to its large size and reconfigurable payload bay, the system will have the ability to travel extended distances carrying multiple mission payloads simultaneously, loiter with the ability to periodically establish communications, deploy payloads, and transit home. The other contender for the programme is Boeing, which has also been awarded a Phase I XLUUV contract. Boeing’s design is based on its 51ft Echo Voyager, which it is developing with an extensive internal and external payload volume and available energy capacity, expanding the parameters of what is possible in current unmanned undersea systems. The vehicle has the autonomy to perform missions for months at a time – and this is a key capability that the navy is seeking under the programme. Current UUVs are limited by the difficulty in communicating through water in a way that UAS are not. As a result, development here is being in part driven by the need for the system to be able to make rule-based “decisions” on what to do if it gets in trouble while off-grid, in order for it to be able to complete its mission and return to base. Unmanned technology is undoubtedly one of the most interesting areas of military development, and an area in which R&D teams continue to push the limits of what is possible. As for how this area will develop in future, only time will tell – but it will be fascinating to watch.